Once again I'm joining other bloggers around the world in a BlogCatalog event. Last year, I wrote about acts of kindness, and to my surprise, my post came in 8th place (this is, to me, my biggest achievement as a blogger, you should see some of the stories I was sharing my prize with!). 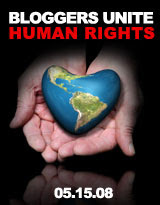 Today's theme is Human Rights. As Ellen from Positive Communication points out very well, this is not only the 60th anniversary of the Universal Declaration of Human Rights, but also the year in which the Olympic Games will be hosted by Beijing, China (where human rights are not being especially taken into consideration). Please go here for a list of all the posts from Blogger Unite! 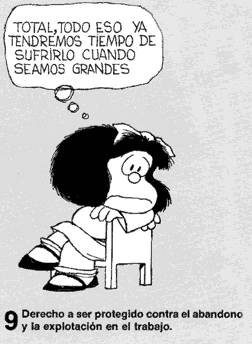 I come from Argentina, a country that is normally known because of its soccer, basketball or its '5 presidents in a week' moment in 2001. I lived for over 30 years in what is considered to be one of the richest countries in the world, and could not believe my eyes whenever I read about kids dying of hunger in the northern province of Tucumán or the many kids that live on the streets of Buenos Aires and Rosario (the two biggest cities). In a place so rich, so full or resources like my home country (where we use to say that if you drop a seed anywhere, it will grow), the fact that we have so many kids dying of hunger, or not being able to eat well, or to go to school just breaks my heart. 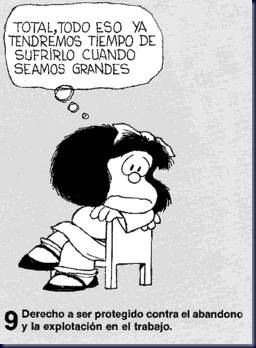 I was reading at Bebés y más about the paradox of this happening as we in the Northern Hemisphere worry about child obesity. 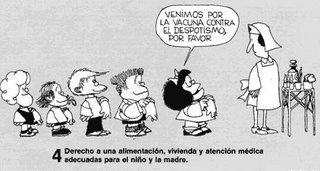 Recent statistics indicated that 1 of every 5 kids in Argentina is somewhat malnourished (the official statistics speak of 13%). It's just unbelievably sad. There are many reasons for all this to happen, but there are no doubts about the main one: corruption. "Our society is corrupt", many will say. But they speak only about the politicians, and that is a gross oversight. Our entire society is corrupt. Those who criticize the politicians, clergy, military, etc. and blame them for all our problems, are the same who will bribe the police officer that is writing them a ticket for running a red light, or the same that give the guy at the theatre an extra $10 "under the table" so they would magically find tickets in a much better row than the one they originally had. Those are the same who will never pay their taxes or put money towards retirement: "What for? So my money ends in some minister's pocket?". Those are the same that will only go out and protest when their own money is at risk, but will continue to play dumb every time they are in front of those disturbing news (and images) about our dying kids. 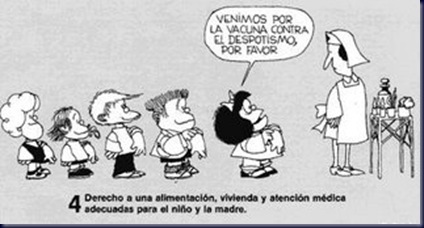 In the meantime, more than half of the population of Argentina (20 million people) is considered to be below the poverty line. According to UNICEF, 22% of the urban population (6.000.000 people) live in indigence, not being able to obtain proper food. The malnourishment during the first two years of life leave irreversible sequels in the person's height and intellectual ability. What can we do? I certainly don't know. I guess the best advice I can give is: do what it's expected of you. In all my years as an active worker in Argentina, I never -ever- stopped paying my taxes in time, and I contributed to my retirement every single month (I didn't owe a dime by the time I left, and that was money I will never be able to collect). Pay your taxes. Be responsible. Look for opportunities to do some volunteer work. There are so many unknown heroes that feed hundreds of kids with almost no support (either official or private). 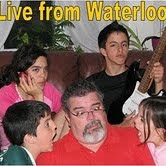 See what can you do for your kids. I know, I don't live there anymore. But I still refer to Argentina as my 'home country'. It's the place I come from, and it's a huge part of what I am. Knowing about 'our' kids and how they struggle to live still hurts me. A lot. Let's now review UNICEF's Right of the Child according to Mafalda, the most celebrated creation of that Argentine genius called Quino. Maybe we can end the day with a smile, and it will be all because of him. 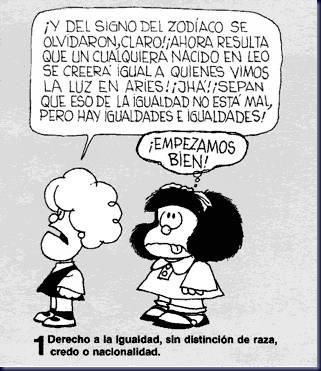 I left the originals in Spanish, and included my own English translations. 1 - Right to equality, regardless of race, creed or nationality. 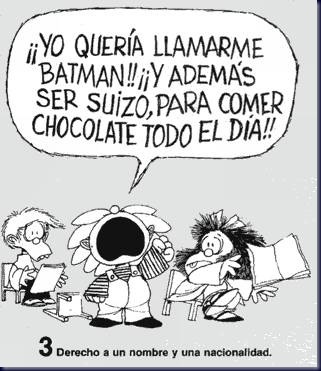 Miguelito: I wanted my name to be Batman!! 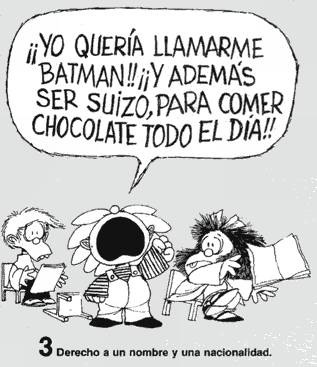 And be Swiss, so I could eat chocolate all day!! 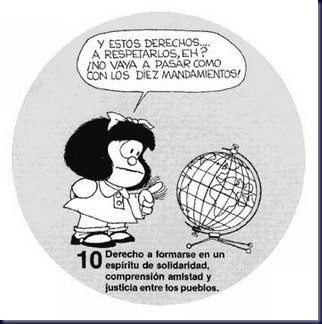 Mafalda: We're here to get our immunization against despotism, please. Susanita: My mother feels very moved by handicapped kids. She is so sensitive that she can't even experience the pain of realizing that they exist. Poor Mom! Manolito: Work with me here... Shouldn't we get paid for being so lovabl...? 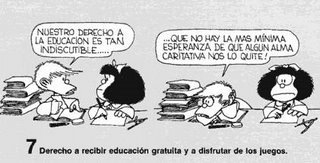 Felipe: Our right to receive education is so indisputable... that we have no hope on a caring soul to come and take it from us! 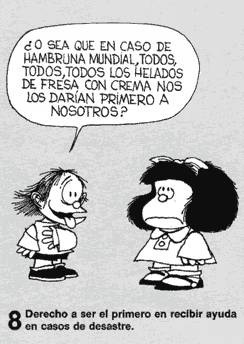 Guille: So in case of a world hunger, we would get all the strawberry and vanilla ice creams first? 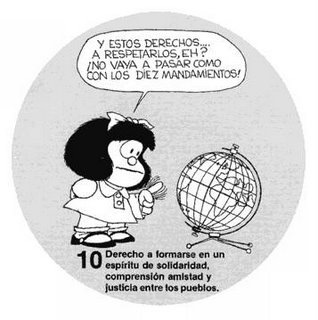 Mafalda: And let's observe these rights, OK? So we make sure we don't do what we did with the ten commandments! Enter a link to your post here! Nice post...I myself joins several initiative to help alleviate poverty specially among children...the scenarios around the world is quite alarming already. Thanks for making this post! And thanks for kind thoughts and hugs! 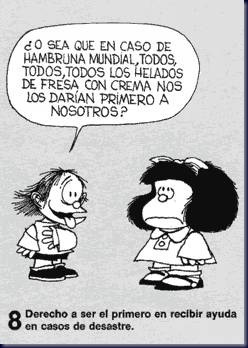 Y el problema se agrava ahora con la crisis alimentaria, promovida por los biocombustibles y nuestra forma de vida donde gastamos mucho mas de lo que necesitamos. Suscribo tus reflexiones. 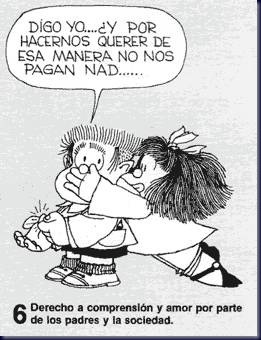 La realidad sin máscaras nos muestra un mundo de desigualdades y dolor silencioso. 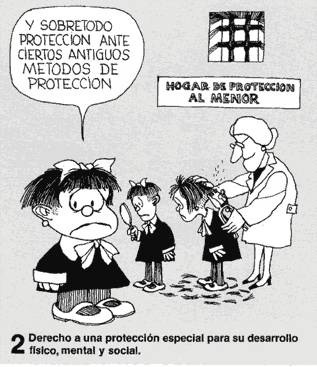 Todo comentario para desenmascarar las cortinas de hipocresía es poco. Me ha gustado tu exposición y la forma tan amable y simpática de ilustrarla. Esta iniciativa de Bloggers Unite la tenemos que repetir. Very good! Quino is always inspired and inspiring. One of my favorites.